Elkmont began as a logging town with the Little River Logging Company having its base in the community. Only a couple of years after the establishment of Elkmont, the logging company began to sell parcels of land. Thus began the "Resort Era". Soon after that, a hotel was built (the "Wonderland Park Hotel "). After the founding of the National Park Service, the ownership of the cabins eventually fell into the Parks' hands. Today the main attraction in Elkmont (besides the nature!) is the campground. The facilities at Elkmont are much like Cades Cove: no water or electricity at the campsites. This is one place we haven't camped yet, but I hope to sometime soon. Hello! I'm stopping by from the A to Z Challenge. Nice to meet you! :) GREAT pictures!! Elkmont looks beautiful! I bet is smells fresh and lovely there. One of the things we do well is dry camping. I am always looking for great campgrounds so this is being added to my list should I ever make it back to your area. It does look beautiful. I remember seeing the sign before, but have never checked it out. 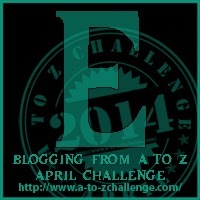 I am totally loving your A to Z Challenge.